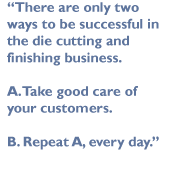 In the die cutting and finishing industry, there are two kinds of companies. There are the companies who specialize in doing work for anyone who walks in the door, no matter how big or small the job, no matter how frequent or infrequent the work. No matter how simple or crazy the specs. Then there's Alternative. Our business is not based on attracting as many customers as possible and hoping for the best. Our business is based on establishing great working relationships with clients whose main concerns are dependability, innovative thinking, reliability, high quality execution, process control and turnarounds that are fast, but without ever jeopardizing the quality of the work. As you can well imagine, we don't have a huge roster of clients. But we do have a small roster of great clients. Clients who receive an overall quality of service that's much higher than the industry standard. Clients who know they can talk to the boss just by picking up the phone. Clients who know that we care as much about the quality of their work and the challenges they are facing as they do. This web site is the intellectual property of Alternative Die Cutting Inc. Site designed and managed by TMHR Solutions.